If you have a cat or cats in your home, no doubt you love them dearly. Where that love could be tested is if they are unable to control their bladder and frequently pee on your carpet, flooring or furniture. We can't give you veterinary advice here to resolve the peeing if there's a medical issue, but what we can do is give you a solution to protect your home. Our reviews will highlight the best cat diapers and give you tips on how to choose the right diaper for your cat. As well as preventing your cat piddling on your carpets, the cheetah pattern will also ensure that they are the most fashionable cat in the neighborhood. 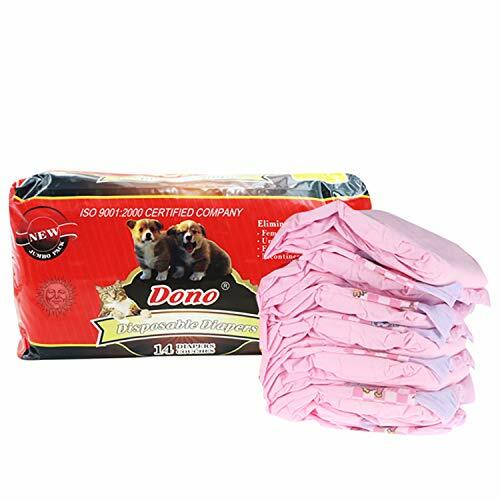 Whether your cat piddling is due to them being a female in heat, a spaying male, or simply because they have become incontinent, these diapers should provide your floors with some respite. Putting them on your cat is very easy, especially with the adjustable tabs allowing you to make it fit comfortably. There are a range of size options when you purchase, so whether your cat is small or large there'll be one to suit them. The standard diaper allows your cat's tail to fit through a gap at the back, however, you can request a 'no-tail' version if your cat is a tailless breed. These diapers employ three layers to help keep them waterproof, and comfortable. The inner layer is extra soft for comfort, the outer layer is a polycotton material, and sewn between them is a moisture barrier which is waterproof. Finally, we have the styling of these diapers which is as distinctive as you are ever likely to see. They have a cheetah pattern on them, which certainly catches the eye. These disposable pet diapers are suitable for both dogs and cats, and as well as preventing liquids from escaping, they can also help retain odors too. You want your cat's diapers to be leak proof, and these are certainly that. It achieves this using a special resin material which absorbs the liquid and turns into a jelly. This resin also kills bacteria, which are the source of unpleasant smells, so that helps keep your cat odor free. The rest of the diaper's materials includes ruffled edges which keep them leak proof. The diapers are breathable which helps keep your cat comfortable, and the adhesive fasteners are reusable. You can unseal, adjust and reseal them so that they fit perfectly, and not tugging at your cat's fur. A hole for your cat's tail has been cut, so it helps with the comfortable wearing of these diapers for them. These will fit cats who weigh from 13 lbs. up to 38 lbs. and is suitable for girth sizes of between 17 and 25 inches. These pet diapers come as a set of 3, which can be washed, and as each one is a different color, you can color coordinate your cat each day. Let's start with these three colors, which are blue, green and purple. 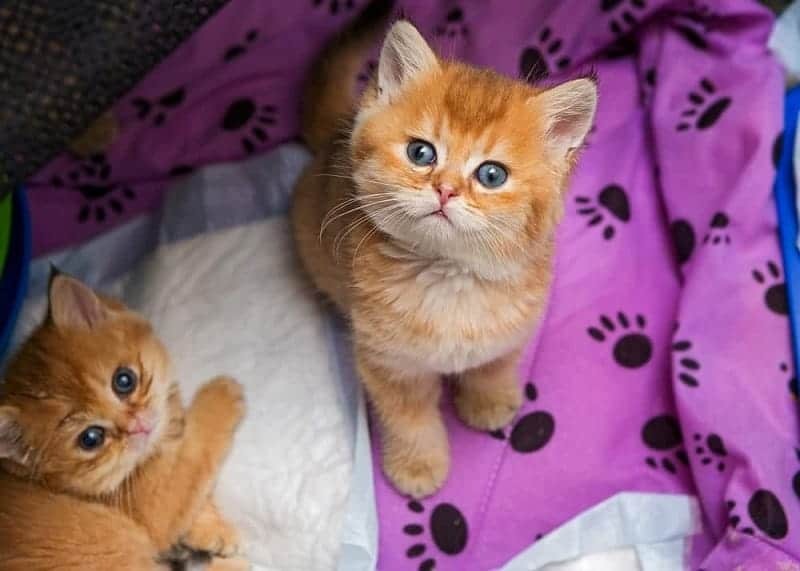 Depending on how often you need to change your cat's diaper, you can either have them wear different colors through the day or a different one each day. It might be prudent to buy more than one set, so you have multiple diapers of each color. There are four size options too, which are small, medium, large, and extra-large. 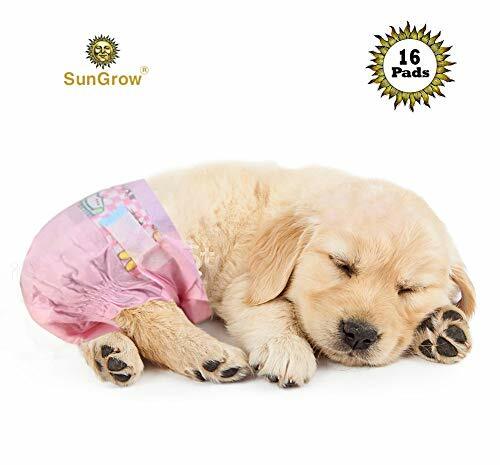 The inner is very soft, so it feels comfortable against your cat's skin, and this layer is also absorbent, so any accidents are quickly retained by the diaper. 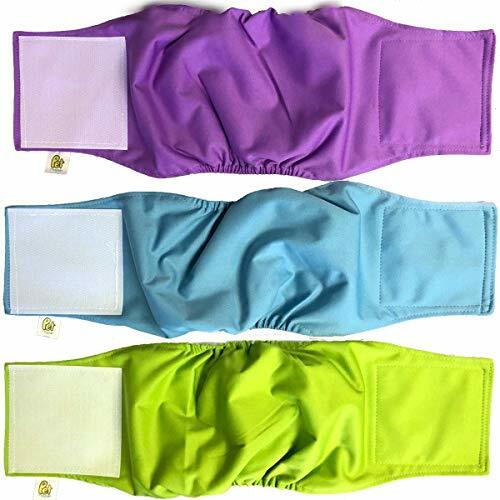 The elasticated edges help to keep the diapers leak proof and enable them to fit snuggly. There are Velcro tabs which let you fasten the diapers securely, but also allows you to adjust them so that they are not closed too tightly around your cat's girth. These can be worn by dogs and cats, to address issues such as incontinence and accidental peeing. They are disposable, and more suited to medium to larger cats. Each pack comes with 16 disposable diapers, and they are sized to fit cats with waist sizes of between 12 inches and 20 inches. They have a hole for your cat’s tail so that when the diaper is on, it feels as natural to them as possible. Should your cat pee, the proactive layer which deals with moisture will soak it up and turn into a gel. This reduces the amount of liquid the diaper must retain and thus reduces the chance of any of it leaking. It also reduces any discomfort your cat might have felt if their urine was allowed to rub against their fur and skin. The other benefit this layer brings is that it is anti-bacterial. This means it will kill any bacteria within the diaper and as result reduce the odors which they can generate. To close the diapers and keep them in place, there are tabs which use a sticky tape to seal them. However, if you need to, you can release the tabs, adjust them, and then re-stick them. While cat diapers are relatively simple products, there are a few features which you need be aware of when buying one for your cat. These features may differ between the various brands so knowing what they are will help you choose wisely. This is the one feature that probably has more impact on you than your cat. If you don't mind machine washing pee-stained diapers then go for them, as they will prove to be more cost-effective, than disposable which must be repeatedly purchased. Most diapers will either have a tail hole or designed in such a way that the cat's tail area is open. If you have a tailless breed, some products have a no tail hole option. Most diapers have one of two ways in which they are closed. These are Velcro fasteners and sticky tape fasteners. Velcro ones tend to be a bit stronger and less prone to ripping off. Sticky tapes tend to be lighter, and less likely to get fur caught in them. If you select diapers that use sticky tape, ensure that it is resealable. This allows you to peel it back and adjust the diaper, before resealing it. Whichever closure you use, when sealing them do not pull them so tight that it causes your cat any discomfort or restricts their movement. Obviously this is the most important element of the diaper, and how waterproofing is achieved, varies from diaper to diaper. Disposable diapers tend to use a special resin which reacts and turns to a jelly material. This means all the liquid is effectively turned into a semi-solid, so it reduces leaks and discomfort for your cat. 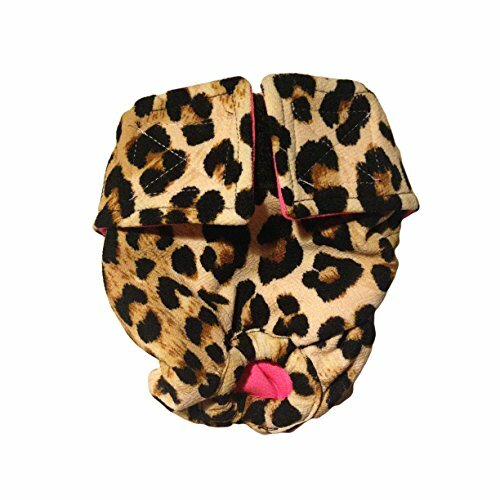 In machine-washable cat diapers, an absorbent layer is sewn between the outer layer and the inner layer. This will absorb liquid and retain it, until the diaper is removed from the cat so that it can be washed. No doubt you want your cat to be as comfortable as possible when wearing their diapers, and this can be achieved in several ways. First, ensure you purchase the right size for your cat, and if anything, err on the side of one size up rather than one down. When you are sealing the diapers make sure you do not pull it too tight, and that none of your cat's fur is stuck to the fasteners. If you do, it can lead to your cat trying to remove the diapers which defeats the whole point of the exercise. All four of the cat diapers we have reviewed will help keep floors, carpets and even furniture free from your cat's urine should they have an issue with peeing involuntarily. It was hard to choose a winner, but we feel that the Pet Magasin Luxury Pet Diapers just has the edge over the others. The fact they are machine washable makes them excellent value for money. Coming in three different colors is fun, but also practical, as you can select a different color for each day, especially if you buy multiple packs. They are comfortable for your cat, thanks to the soft inner layer, and the waterproof layer does a great job of absorbing all the moisture. The elasticated sides make them leak proof and ensure that they fit snuggly around your cat's waist. Cutting your cat's nails is a grooming process that requires high levels of concentration and care. While there is nothing particularly life-threatening in trimming your cat’s nails, you may cause them discomfort and pain if performed incorrectly. Because of this, it's essential to have the very best nail clippers and strong knowledge of how to use them with your cat's unique needs. Although trimming your cat's nails is an integral part of cat ownership, many cat owners are reluctant to trim for fear of hurting the cat. Trimming your cat's nails can be intimidating at first, although once you learn how to do it successfully, clipping your kitten's nails is almost as easy cutting your own. For the very best results, use a tool that is made especially for cats. Keeping your cat's nails trimmed is not just a part of the grooming process, it is also essential for your cat’s health. Nails that are left untrimmed can cause a variety of issues including broken nails that can bleed and are painful. An indication that your cat’s nails are too long is that they are getting caught in your clothing, furniture, and carpet. Furthermore, trimming your cat's nails can reduce cat scratching behavior and damage to home furnishings. Nail trimming can be a positive alternative to using soft claws or declawing your cat. Most cat nails are long and sharp, and they are accepting of getting them trimmed. However, every cat's nails and behavior is unique. Based on your cat’s needs and preferences you may prefer a different type of clippers. There are an array of cat nail clippers available on the market, so you should be aware of the essential components a nail clipper should meet. When considering the best choice for your cat, review this list to discover the Best Cat Nail Clippers of 2018. How many claws does my cat have? How do I cut my cat’s nails? What do I do if I cut my cat’s quick? Are you new to trimming your cat’s nails? Then the Shiny Pet Nail Clippers may just be the choice for you. 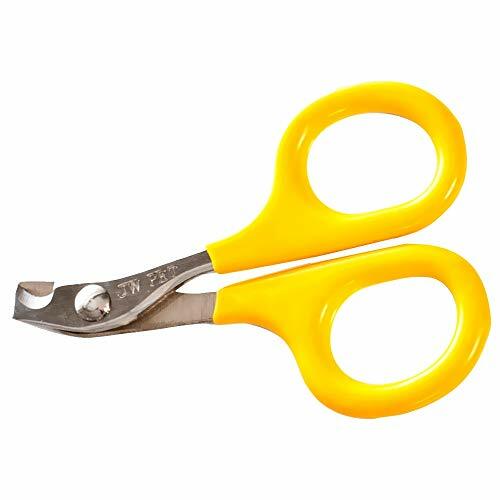 These scissor style nail timmers are easy to use and provide a quick, clean cut for your kitty. Shiny Pet Nail Clippers are specifically designed for small animals, including your cat. The ergonomic handle is made from 100% recycled plastics and hypoallergenic materials, while fitted angled blades are crafted from stainless steel. A slip-proof coating improves grips and reduces accidents. As an awesome bonus, these nail trimmers come with complimentary Ebook guide with tips on how to use this pet nail cutter. As with all Shiny Pet grooming suppliers, the Shiny Pet Nail Clippers are backed with a lifetime money back guarantee. The angled head of these nail clippers makes all of the difference in preventing split or broken nails. Not only are these nail clippers easy to use, but they also come with a convenient Ebook designed for beginners. The rubber grip really does prevent slippage, and the product even works well against tough, thick nails. We love that these nail clippers are environmentally friendly and made from recycled materials, not to mention hypoallergenic. While some cat owners seemed to enjoy the simplicity of this design, others found that the blade becomes dull after just a few uses. In some cases, the edge was not sharp enough to begin with and did not provide smooth cutting action, inducing splinters and breakage. 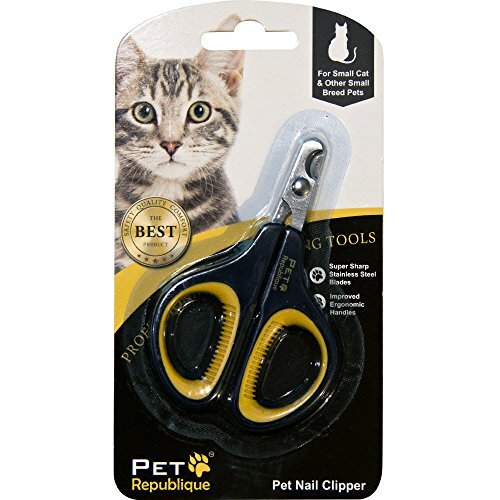 If you need quality cat nail clippers and want to help other animals in the process, then you can't go wrong with the Pet Republic Pet Nail Clippers. When you purchase this scissor style nail clipper 15% of the proceeds help other animals in need. 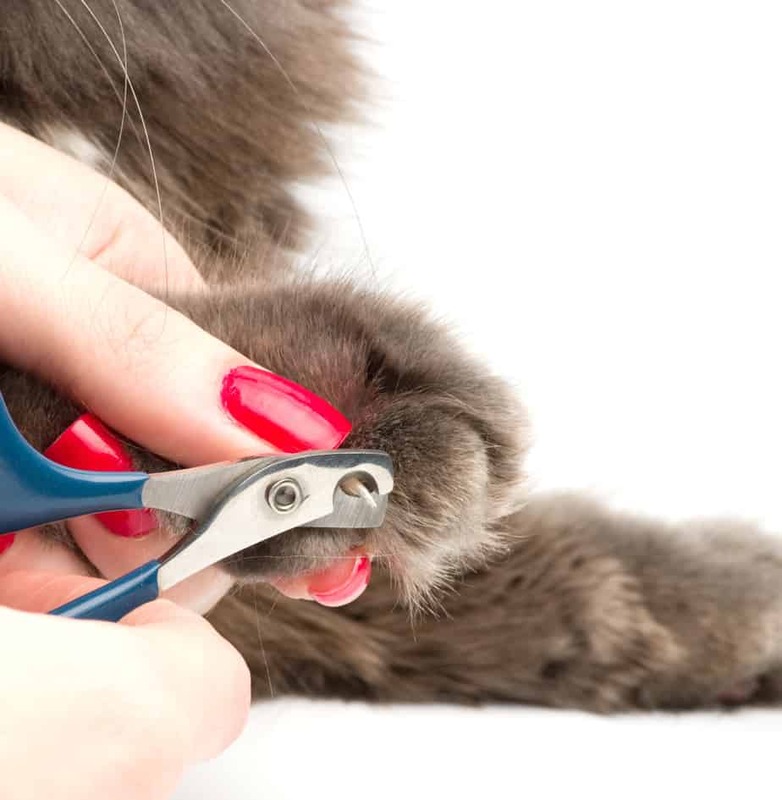 These p­rofessional cat nail clippers are designed specifically for small breeds, including kittens and cats. The Pet Republic Pet Nail Clippers are crafted with thick stainless steel blades, promised to remain strong and sharp even after years of use. During the production process, these nail clippers are fully quality controlled, so you receive a top-notch product every time. Built-in spring and non-slip handle provide smooth, fast cuts, every time. The angled blade also protects against pet injury. The product also comes with a safety blade lock for safe storage. In addition to part of the proceeds going to animals in need, the Pet Republic Pet Nail Clippers is a quality product. The thick blades really do provide a sharp and clean cut on most cats, while the soft rubberized grip reduces avoid the possibility of slippage. Excessive hand pressure is not required to make cuts while safety lock keeps them entirely closed when not in use. We wish that the guard was adjustable for cats with longer nails. Others found that these clippers were a little large for their cat; therefore the guard didn't provide much protection. While the price is affordable, we were hoping that blade would be a bit on the sharper side. Need a fast and affordable way to clip your furry friend’s nails? Then the JW GripSoft Nail Clippers are the best option for you. The JW GripSoft Nail Clippers is designed explicitly for your cat's nails. Convenient, non-slip handle is comfortable to hold. The small design is just the right size to quickly and safely trim your cat's nails and provides a safer grooming experience for your pet. Suitable for all cat breeds, this quick and easy nail cat trimmer is a great tool to have in your home. For the price of this product, these nail clippers were surprisingly sharp, meaning a quick and painless grooming process. We love that this product comes from the JW Feline only grooming lining, meaning that they were sized and designed specifically for cats. The non-grip handle also helps in ensuring a safe experience. While this product is likely to get the job done at an affordable price, they are not a long-term nail cutting solution. After just a few uses the blades began to overlap. Others found that the handle was tough to open and close, creating a frustrating situation while attempting to quickly and efficiently trim their cat's nails. Larger cats or cats with robust nails may have difficulty with this product. OmegaPet has worked with some of US's leading pet manufactures since 2013 to provide efficient, safe, and fun pet products. Their Omega Pet Nail Clippers reflect the same focus on the health and happiness of your pets as their partnerships and other pet products. Omega Pet Nail Clippers makes nail clipping time for your cat easier than ever before. Precision engineered stainless steel, and long ergonomically designed handles give you a clean cut every time, while a quick safety guard eliminates fears of over-cutting. Plus, these clippers come in two convenient sizes to fit the needs of every cat from petite to large. The product is sturdy, light, and sharp promising a lifetime of clean cutting. The Omega Pet Nail Clippers requires little pressure to provide results. Quality construction is evident just by the weight of the clippers. The quick guide is extremely helpful in locating and protecting your cat's quick. If you accidentally hit the quick, these clippers stop entirely to protect your feline. This product comes in two convenient sizes to fit your cat's needs. While this product was initially sharp, it seems to become dull after a couple uses causing splintering and breakage of strong nails. Handles are also a bit bulky. Cat owners will small handles may find difficulty in using. When your cat’s nails start to grow too long, you need a reliable pet nail trimmer that will prevent pain and scratching of floors and furniture. The Glendan Pet Nail Scissor will let you maintain just the right length to protect your pet’s health without hitting the quick. 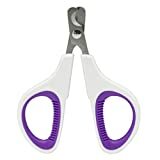 The Glendan Pet Nail Scissor is manufactured with a thick, high-grade, sharp, rustless, stainless steel blade to ensure your cat nail trimming process is stress-free, quick, and smooth. Say goodbye to overcuts with a safety stop blade. One-cut edges ensure an ultra-sharp even cut every time for nails of all shapes and sizes. The Glendan Pet Nail Scissor features a comfortable rubber handle for an ergonomically designed grip. Well suited for kittens and cats, these clippers come in three convenient sizes: small, large, and mini clipper to fit every feline need. Glendan stands behind the health and happiness of your cat, providing a 90-day money back guarantee – no questions asked, along with a 365 quality guarantee. The Glendan Pet Nail Scissor is strong and sharp. The mini-version is perfect for kittens and small cats, providing easy nail clipping in a completely stress-free environment. They are also very sturdy and last a surprisingly long time. The comfortable grip works well in preventing slippage while the ergonomic design is comfortable and easy to hold. As far as trimming cat nails, this product did not cause any splintering or breakage. Safety-sop blade provides full protection of your cat's quick. For such as simple product, we were surprised at how well it worked! They are convenient, sturdy, and perfect for cats. Those that used these clippers had no complaints whatsoever. By now you have probably noticed that different nail trimmers have distinct advantages in giving your cat the best and most comfortable cut. Some nail trimmers also pose particular risks of causing your cat's claws to break and splinter instead of giving them an even clean cut. 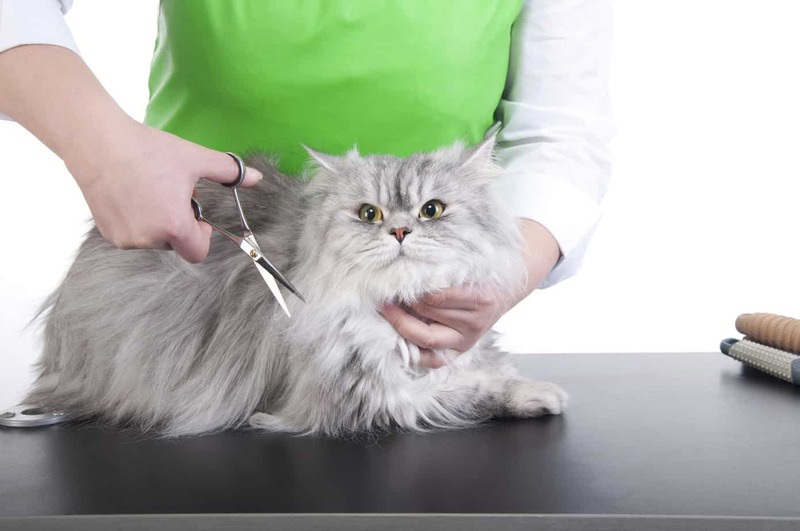 In an effort to reduce these risks it is essential to understand how to trim your cat's nails and the differences between various trimmers available on the market. To help you confidently protect and cut our cat's nails, explore these pet nail clippers and their designed use cases. This type of nail clipper is modeling after a standard pair of scissors. The only difference between these clippers and a standard pair of scissors are the shape of the blade. Scissor nail trimmers are great because they are quick and easy to use by even the most inexperienced trimmer. This cat nail trimmer gets its name from its blade design. 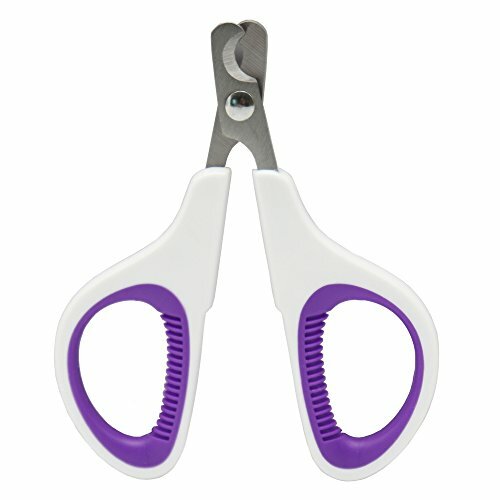 This is a good option for those who have trouble gripping a plier cat nail trimmer handle, making the action of trimming your cat's nails simple without breaking or splintering. However, this is not a popular option for cats because it is hard to determine exactly where to cut the nail. This nail trimmer is a preferred choice for cats that don't like to stay still enough to clip their nails correctly with a nail clipper. An electric nail trimmer is an excellent choice because it removes the risk of cutting your cat's nails too short. They are also easy to use. However, the noise takes some getting used to and can scare some cats. Most cats have four toes on each back foot and five on each front foot, for a total of 18 toes. Each toe has one claw or 18-claws total. Polydactyl cats, on the other hand, have six or more toes on the front and five on the back. This genetic glitch can be found in any breed, although it is rare. However many toes your cat has, the same level of care is required to maintain healthy claws. Start by setting the mood. While you cut your cat's claws, there should be no loud noises or interruptions that could startle him or her. Place your cat on your lap with his backside under your elbow. Let him or her sniff the clippers to become associated with them. Face the paw down and gently pinch each toe causing your kitty's nails to protract. Practice by massaging your cat’s feet and getting them used to the motion. When you are ready to cut, notice that the tip is translucent. This part doesn't contain any nerves so your cat will not be able to feel where you have cut the nail. Position your blade at a 45° degree angle and make the cut. Further down your cat's nail, you can see the nerves and blood vessels that control your cat's toe. This is known as the quick. You want to avoid cutting this area as you could cause your cat pain. If you accidentally cut the quick, apply a small amount of flour or cornstarch to the tip of the nail. This will act as a coagulant and stop the bleeding long enough for a blood clot to form. If your cat's bleeding does not subside within 30 minutes, you should contact your veterinarian. Trimming your cat’s nails doesn’t have to be a struggle. In fact, if you begin when your cat’s just a kitten, it probably won’t ever become a big deal. Furthermore, clipping is a lot healthier than declawing a cat. But even if you just start clipping your adult cat’s nails today, you’ll get through it just fine with the right tools on your side. Nail clippers work best when they are sharp and you are comfortable using them, so it’s best to choose a product that feels great in your hand and one that protects your feline from potential pain. After reviewing the five products above, the clear winner is Product 5: Glendan Pet Nail Scissors. Not only did this product have a ton of great reviews from cat owners, but it is also jam-packed with all of the features you would hope to find in a proprietary cat nail trimmer. 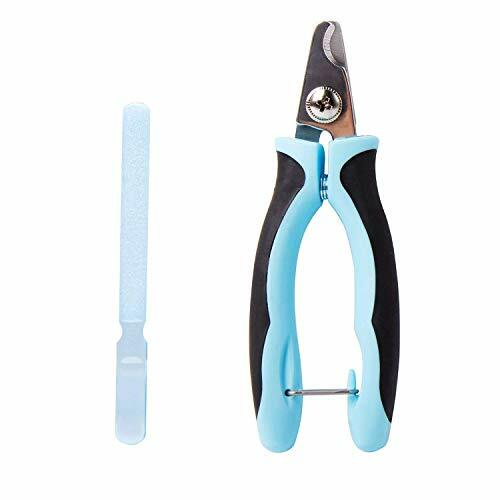 Our pet nail clipper is strong is manufactured with High grade, Sharp, Stainless Steel Blade which ensures that you never do uneven cuts, smooth, quick. The pet nail trimmers is outfitted with a safety stop blade to ensure you do not hurt your pet and greatly reduces the risk of deep cuts leading to bleeding or serious injury. 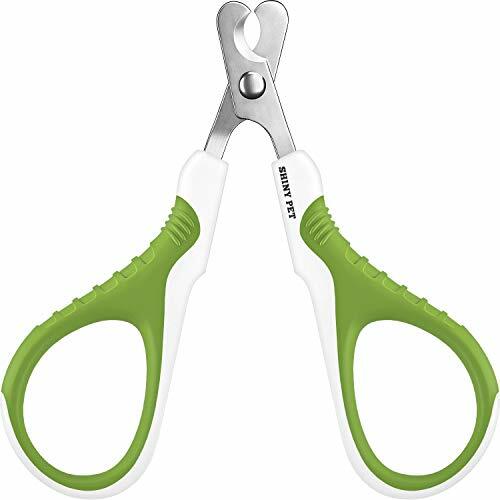 Our Pet Nail Scissors Handles feature an ergonomically designed rubber handle for a comfortable grip. The Glendan Nail Clipper has an ergonomically designed non-slip handle and quick safety guard, manufactured to protect and precisely cut your feline's nails with ease. We love that this product comes in three convenient sizes so that you can choose just the right clippers for your kitten, cat, or large feline. This product is extremely sturdy and designed to last. Priced at $9.99, this is an essential tool to add to your cat's grooming box. Grooming may not seem to be as necessary of a process for cats as it can be for dogs, but it can really help in a lot of ways! Whether you have a long hair cat, a cat with frequent hairballs or perhaps one that is susceptible to fur matting and hot spots, grooming can be a fantastic solution. That is why most cat lovers still do opt to look for the best cat grooming clippers to have a fresh, healthy and well-groomed cat as it can be very pleasing to smell, look and touch. This will also save you the trouble of putting your cat into your best cat cage and go to a professional pet groomer. Those who have visited a professional pet groomer know that grooming declawing a cat can be a very costly thing. That's why many people look for ways to handle the grooming themselves. In order to help you find the ideal cat grooming clippers and other tools, we're going to give you information on some popular options on the market today. How often should I groom my cat? Should I trim my cat's claws too? Should I bathe my cat before grooming? Will it help with hairballs? 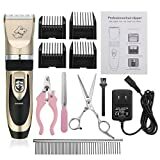 These clippers are a lower cost option that can allow you to handle your cat's grooming needs without having to spend the money taking them to a professional. It comes with a few accessories to help make home grooming easier and offers a lightweight way to get the job done. While lighter and less expensive, these are known to be heavy duty clippers. It will be able to get the job done for multiple uses. 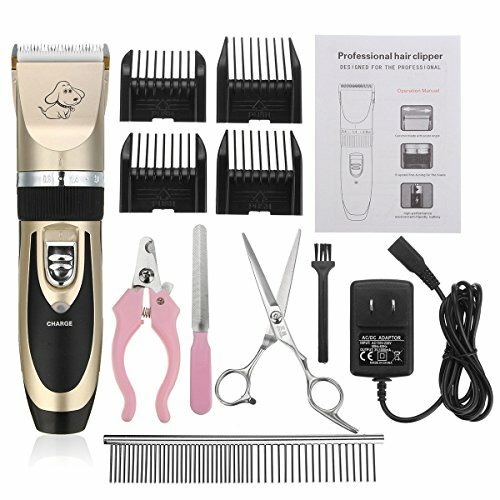 Includes a pair of scissors and a stainless steel comb to help with capturing and trimming some of the more difficult hairs. You'll also get multiple combs to ensure that you get the right length for the cut every time. Because this is a lower cost option, it will give you the ability to handle fur matting and thicker hair on your own rather than having to pay $100 or more to a professional groomer. If you have a pet with longer hair, this can really help with cleaning it up and helping your cat to avoid ingesting too much of it, which can lead to hairballs. There are a few issues that can pop up when you attempt to groom your cat yourself. These can include issues with the blade in particular. A few customers have noticed these clippers getting stuck in their pet's fur, which can lead to an uncomfortable situation for your pet. Some also find the scissors to be too dull and not cut as well as other options. This great kit comes at a slightly higher cost than other options, but comes with a lot of grooming accessories as well as those that help to take care of your device. It's a low-noise option made to refrain from irritating your pet while getting the job done at a lower cost. Includes clippers, different styles of scissors, stainless steel comb and four guiding combs. Cordless model to avoid cord entanglements. Sharp blade design. Allows home-grooming option. Can be used for professional pet grooming. 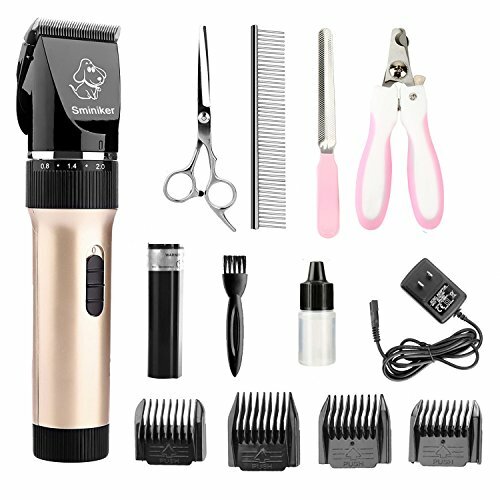 Many pets can become stressed by the sound of an electric clipper, so the fact that this option is designed to run more quietly is fantastic. It's made to be easy, but also durable so that you can have something to rely on for as long as you need it. It's also a great way to save money handling fur trims yourself rather than having to take your pet to a groomer. As a more budget-friendly option, there are some breakages that can happen from time to time. The blades, guiding combs and other parts can sometimes break unexpectedly. Some customers have also found that the clippers may stop holding a charge. Make sure to be careful with the clippers and accessories, clean well after each use and contact support as soon as possible if there is a problem. This kit is a lower-cost option that works for multiple types of pet hair, from long to thick to curly. There are several pieces to it, including clippers, scissors, nail trimmers and file. You'll also get multiple guide combs and a stainless steel comb for brushing out any tangles. This kit is a great solution for handling grooming things in a simple way. Fast and quiet design, noise-free grooming kit. Detachable sharp and durable blades. Very easy to use, clean and maintain. Adjustable clippers with 4 comb attachments. This kit is advertised as something you can use on multiple kinds of pets, including cats, dogs, and even rabbits! So if you have multiple pets, you can still get the benefit of being able to use this kit to groom them. It comes with a lot of accessories so that you can do a complete job and gives you a lot of overall value for the cost. You'll surely be able to save a lot of money by using this kit rather than going to a groomer. Low cost options often come with some concessions that have to be made. For this kit in particular, the materials used to make the clippers might not be the most durable. You may experience some breakages with them or smaller accessories that come with them. Some may also find that the blades or scissors might not be as sharp as they need, but this can depend on your pet's fur. There are a couple of things to keep in mind if you're considering finding a pair of electric clippers to save money. The first is the durability of the product, which can determine how long it will take before you need to replace the clippers or blade. The second are the accessories included, as it can take more than just clippers to do a complete cleaning job. Over time, having a quality pair of electric clippers to groom your pet with can wind up saving you hundreds of dollars over taking your pet to a groomer. That said, if you have to replace your clippers too often then you may find the savings are less. Because of this, it may be a better idea to pay more initially for a great pair of clippers that will last a long time. It may seem like a larger investment at first, but over time it is sure to pay off. If you can have the chance to handle a pair of clippers to feel how heavy-duty they are prior to buying. Of course, that's not always an option when you're buying online. The next best thing is to take a look at pictures that other customers have sent in. These can offer you a lot of information about what to expect from the clippers you choose. If you're shopping for kits, then the included accessories can also be very important. You'll want to consider the kinds of things you'll need to be able to do. For example, will you want to be able to style your pet's hair or just give it a little trim? Are you going to want to be able to trim and file claws or do you use another means of nail care, such as nail caps? With cats in particular, trimming nails can be an important aspect of grooming. If you don't already have a quality pair of nail clippers then it might be worth buying a grooming kit that has a pair with it. 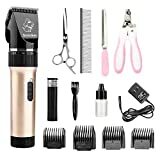 Overall, getting these additional tools as part of a kit with your choice of clippers can sometimes save you money over purchasing everything separately. For just an added info, the best cat shampoo is also considered to be part of a grooming kit as they usually take a bath after a successful grooming. Of course, that's a separate purchase apart from a normal grooming kit being sold. This can vary depending on your cat and the length of their coat, as well as any problems your cat may tend to have. For example, if you have a long-hair cat that is prone to matting then you may want to brush and trim on a weekly basis. Otherwise, if you have a short-hair cat then you may only need to do small touch ups every couple of weeks or once a month. Different kinds of grooming can help with different problems, of course. Even a short-hair cat can succumb to hairballs from frequently grooming themselves. At a minimum, brushing a short-hair cat regularly can help put a limit on that problem. Long-hair cats can have more problems that require grooming. They have more hair that can be consumed or get in the way, so having a good clipper kit can really help to keep their fur in a healthy, comfortable state. Regular grooming can help to avoid hot spots, hairballs, excessive shedding and fur matting that can leave your pet uncomfortable. Trimming your cat's claws is a good idea for a number of reasons. Well-trimmed claws aren't able to cause damage to people or furniture as easily. They can also experience less breaking and have less of a chance of injuring another pet if you have multiple pets who like to rough-house. Once your cat has gotten used to having their nails trimmed, it's an activity that can take just a couple of minutes every other week that can help to keep both you and your cat happy. One thing you'll want to keep in mind with trimming the claws of any pet is to look carefully and not cut too far back. In most cases, it won't be necessary to bathe your cat. They are known for frequent self-grooming and that often does the job perfectly well. However, in some cases your cat may need a bath. Cats that are having a major parasite problem are old, arthritic or too overweight to groom properly may need a little help. Or, they may just have gotten into something that smells. In these cases, it's important to use specialized cat shampoo that will be gentle on their skin. Also, only bathe your cat when it's really needed as the chemicals in shampoo can dry out their skin. While cats may be able to stay clean by grooming themselves, it also means that they end up ingesting a lot of fur. When too much of this fur builds up, it can result in hairballs. These are not only uncomfortable for your cat, but they can cause messes around the house as well. Things like brushing and trimming your cat can help to decrease the amount of hair they ingest while cleaning themselves. That will help to at least lessen the frequency of hairballs that occur. Unless there is a severe medical problem that is affecting your cat, shaving them is not a good idea. In either hot weather or cool, their fur acts as a way to keep their body temperature in check. While it may be appealing to shave your cat in an effort to help keep them cool, it can actually damage their temperature homeostasis. Make sure that you only shave your cat fully if they are having extreme pelting or matting. Otherwise, it's better to do a light trim or touch up areas more prone to getting dirty or tangled. When it comes to getting the greatest value for your money, the Sminiker Professional Cat and Dog Clippers is fantastic. It offers a lot in the kit to make sure you have everything you need for a great grooming experience. Heavy-duty gear for proper powerful cut, with stable and steady control. The R shaped edge design prevents from accidentally cutting your pet's skin. New user friendly, we provide3-6-9-12mm guide combs for your reference . Now you can safely trim your pet even if you've never done it before without fearing cutting your pet. With leveled comb, your pet's hair will be trimmed perfectly even. The clippers themselves are designed to be durable and lightweight so they are easy to use. The entire kit is also very budget-friendly. Your cat will look great wearing its best cat collar being well-groomed. Make Pet Grooming Easy - Special quiet design, no more work noise. Groom you pet way more easier than before. You can enjoy some quality time with you little furry friends and give them a safe happy grooming experience. Sharp Detachable Blade - Smooth and Efficient, Prevent pulling or damaging the hair of a pet. Easy to clean, set the collar setting to 2.0mm, then hold the blade, push it down. Come with 4 Comb Attachments and 4 Extra tools, this kit got all you need. Simplify What Is Complicated - Light Weight & Cordless Design, you can chase the dog all over the house without the wire bothering you. It can be used continuously for seven hours after charging for about five hours. *It can work while charging. Due to the shipping restrictions, your package will not includes oil accessories. Thank you for your understanding. Second to this is the Shinemore Pet Grooming kit, which may be a little smaller than the PetPal option, but that's not to say it's also a good choice. If you're looking for something simple and straightforward, then it's a great option to try out. Naturally, animals do not require any cosmetics or bathroom products when it comes to tidying. Most of them would have their own way of cleaning their selves up. It can either be through rain, water or lick their body like with what cats do. However, pet owners usually prefer to provide their pet with the necessary things and equipment. You'd often see a pet owner come down a pet store and look for something that could benefit their pet such as the best cat doors, cages, collars and more. 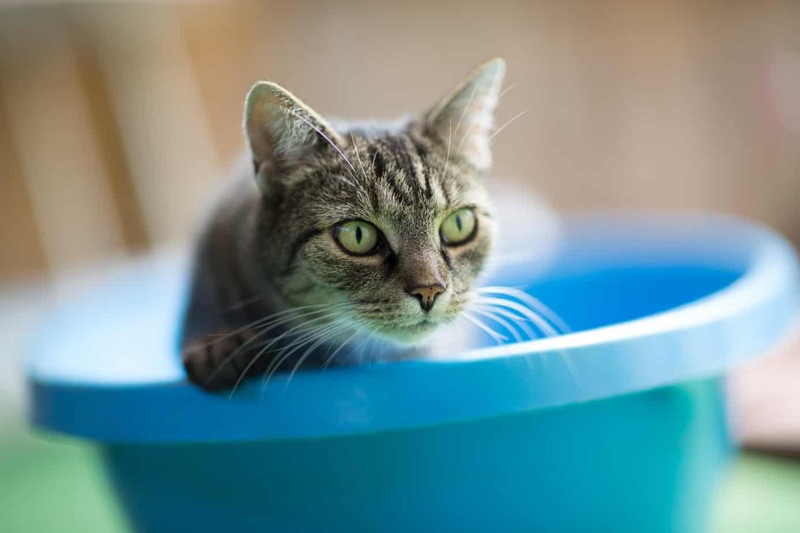 With concerns about pet hygiene, many would prefer to use the best cat shampoo rather than bathing their pet in plain, warm water or with use of human soaps and shampoos. All this is fairly reasonable. Apart from the fact that you would want to spoil them because you love them, you also want something that couldn't harm them or put them in any harm's way. Using ordinary soaps and shampoos can trigger allergenic effects that could result to skin irritation, loss of hair and more. Getting some strong chemical soap and shampoos intended for human use to their eyes also put them in risk of damaging their visual organ. It may sound so simple to others but once you start caring and loving your pet, you would only want them to have the best and get them comfortable all the time as possible. That's why we have composed a list with reviews of the best cat shampoo to help you narrow down your search with the countless possible products that could really give you a hard time deciding. It's based on different key features or points that you need to consider before getting a brand for your cat. Do cats have shampoo allergies? Can shampoo cure itchiness and skin diseases? Can cat shampoo be used for dogs or other animals? Is it really important that a shampoo should be tearless? What's the difference between a cat shampoo and a pet shampoo? The Waterless Cat Shampoo is literally a VET Recommended. It has a nice but not too strong fragrance to avoid headache or trigger some effects to the owner and their pet. It is a detergent and soap free shampoo specifically designed for cats. The great thing about this shampoo is that water is optional. You can use it with or without the use of water. You can instantly apply it to your pet's skin or fur at any point of the day. The shampoo is specifically designed for cats wherein you do not need to worry about complications if applied unlike other universal pet shampoo product. This is great if you want to do a quick bath for your pet. You can apply it and just leave it as is. It could work great for pet owners and cats on travel. The shampoo does not require or makes water optional upon application. It's safe for owners and pets as well as nature friendly. It comes in a recyclable material and ingredients made from natural, non-toxic mixtures. It's fairly just a shampoo. It does not alleviate any allergic symptoms nor does it relieve your cat from itchiness. People who stays at home and got plenty of time to bathe their pet would prefer a multipurpose shampoo that could take care of several skin problems and conditions. One of the cheapest but highly rated cat shampoos is the Burt's Bees for Cats Hypoallergenic Shampoo. This is ideal for cats with allergies using ordinary shampoo, detergent, soap or any bathroom wash. It cleanses their fur and skin and keeps it moisturized. This does not contain any harmful ingredients where in fact, it's mostly made from a mixture of natural extract. The product is fairly cheap for a hypoallergenic cat shampoo. Its natural contents shows that the product is highly safe for pet use compared to most shampoos that uses chemical mixtures which causes side effects and irritations. The shampoo is fairly easy to apply, from ears to tail, and rinse it off with just a few splashes of water. This product may be one of the best cat shampoos but it's not eye-safe. Avoid getting it to your pet's eye as it might cause pain and irritation. The shampoo does not feature other purposes or does not treat other ailments such as dry skin, dandruff or allergies. The Oster Cat Shampoo is best used for cats that experiences excessive amount of hair loss or dander. It's also ideal for treating cat allergies and other skin conditions that causes hair loss. It's made from the US using the best ingredients of natural extracts and essential oils which makes it safe, non-toxic and healthy for cats. The shampoo strives to do its best to be nature-friendly as it is packed in biodegradable materials and uses biodegradable ingredients. The product has a good scent that does not trigger any side effects such as headache, nausea, etc. for the owner. It also has a long lasting fragrance compared to other shampoo products. It uses natural oatmeal formulated to protect, soothe and keep your cat's skin and coat healthy. The shampoo does not contain alcohol, parabens, dyes and other non-eye-friendly ingredients. The shampoo cleans and reduces dander but it does not make the hair any softer or glossy. Some people might find the fragrance or scent a little bit too strong. 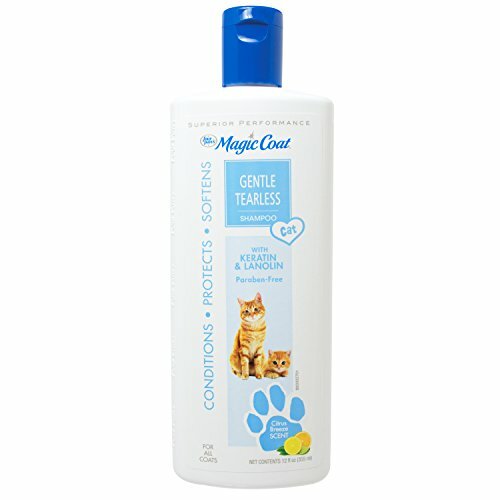 Our fifth pick would be the Magic Coat Tearless Cat Shampoo from four paws. The manufacturer is known to sell different cats and dogs product for quite some time now. Most of their products are dedicated to make the life of our pets easy and comfortable. Adding to that, the products usually have good ratings and reviews. It makes all the sense why this cat shampoo would easily make it to the top. Magic coat will maintain a good looking pet. That goes to say that a well-groomed pet is usually happier, healthier and will be fun at most times. The product is simple and direct to the point. It is made to groom your pet. It does not have any strong fragrance that would trigger any effects. 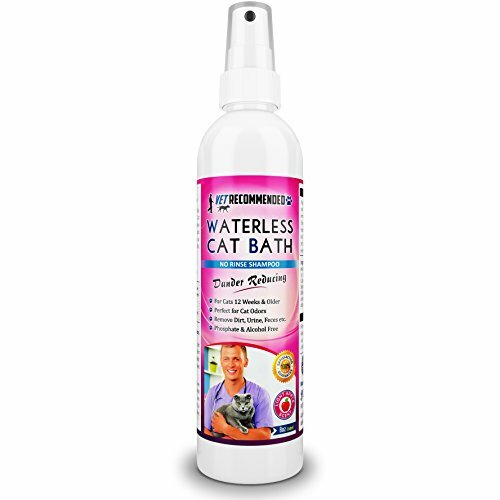 The tearless formula allows your cat to enjoy a long soothing bath. It works to let your pet's coat glow and shine. The shampoo does not treat any skin diseases or disorders. It's just used for cleaning and grooming. It's not hypo allergenic. It's greatly advised for some cats with allergies to test the product first before going all out. Buying the best cat shampoo does not just vary on the ratings and reviews. You would want to consider taking some time in conducting some research and checking out each product based on their key features that you would want to avail for the benefit of your cat. These key features would determine whether or not it is suitable for your pet. A great example in this case would be allergic reactions. Some shampoos contain soap and detergent which could cause your pet to trigger their allergies. Some are too strong that it would cause excessive dander. It is best to know some of the knowledge that could never put your pet in any risk or harm. First thing you would want to know is the formula or composition of the cat shampoo. There are some products with natural ingredients and some oils that can trigger allergic effects to your cats. Know the allergies of your pet and vary it with the composition of the shampoo. Adding to that, there are also some products with toxic ingredients that would damage your cat's coat instead of making it strong and healthy. Next key feature is the versatility of the product. When we say versatility, it's now about how you apply it but rather what type of animal you could apply it to. There are some shampoos made specifically to a single type of animal. In that case, it could cause damage to your cat if it was intended for dogs. Fortunately, there are some pet shampoo products that can be used with several types of home pets such as dogs, cats, rabbits and more. It might not be important to some that just want to have a good shampoo for cleaning but it is also great and possibly to your advantage if a shampoo also have other benefits such as treating allergies, itchiness, hair loss or dander, etc. Either way, the shampoo that can be used for curing skin and hair diseases would not cost that expensive than a regular scented shampoo. In fact, most of it is made with natural ingredients that work gradually to prevent or cure diseases from occurring and the ones that have already occurred. This is not that important but it's also not something you would want to discard as a key feature from a shampoo product. Animals don't like it when you give them a bath. Some animals or pets get annoyed and tend to move around a lot while giving bath. Ordinary shampoo that's not tearless or eye-friendly could flow into their eyes and cause sight damage, irritation and pain. If there's a shampoo with the right key features you want, conduct some extra effort and find out if it has tearless feature or eye-friendly. That depends on the content of the product. We mainly included in the key feature to find out the composition, formula or ingredients of the shampoo you want to use for your cats and vary it with the knowledge of their existing allergies. If you know what ingredients that your cats have allergies with, this will save you a great deal of time in deciding whether or not you want to buy that brand of shampoo or not. There are some shampoos that offer benefits such as gradual curative effect that treats itchiness, dry skin, dry hair, hair loss and more. However, if you want a faster and efficient results, try considering taking your pet to the vet so that they can prescribe a stronger medication with fast and instantaneous effects. If it's not that serious, you can opt for the shampoo as it can save you lots of money than purchasing prescribed medicines. That depends. If you’re purchasing a cat shampoo, it will most likely be formulated based on a cat's physiological needs. Pet shampoo would be the right thing to look for if you want a universal shampoo that could be used for different types of home pets and it usually includes dogs and cats. Using a cat shampoo can either have no effects or cause some irritation. There are some products and ingredients that would have no effects on cats but it can trigger some irritation and allergies if applied with dogs. You can always check out the bottle of shampoo and see its applications so that you'd never experience any complications with your pet. Tearless pet shampoo is not required but it's greatly advised by many experts, professionals and other pet owners. It reduces the risk of eye irritation. Of course, ordinary cat shampoo or pet shampoo can work well if you try not to let it flow or get into your pet's eyes. However, knowing the behavior of pets if they're taking a bath, they would likely move around as they do not want to get wet. It would be hard to control the flow of the shampoo from getting into their eyes. You might also want to avoid shampoos with presence of soap, alcohol and detergent. It is the 3 ingredients that causes shampoo to be bitter and irritates the eye. You can look for a shampoo with only natural ingredients and essential oils as those types of shampoo are usually tearless or eye-friendly. A cat shampoo is usually formulated, specifically to clean or treat cats. Pet shampoo are sort of like universal shampoo that dogs, cats, rabbits, ferrets and other home pets can use. In addition, pet shampoo are usually just used for cleaning and without other specific benefits such as helping to treat dry skin, dander, hair thinning, allergies or itchiness. Cat shampoo and other specific types of shampoo usually have curative benefits used to gradually treat different types of skin and hair diseases. In conclusion, it is always to you and your cat's best interest to investigate and conduct some research about the cat products such as the best cat cage and other kinds you want to provide them. Most of them are made for a good cause and at an affordable price but there are some things that just aren't fit or destined for your cats. Using and testing out a shampoo without knowledge about it would cause some serious damage that could put your cat's health at risk. These cat shampoos and other pet shampoos may not be that big of a deal for some people but there are pet owners who shows great affection to their pet and would want only the best cat products including cat scratchers and more. Who would not want to make their pet's lives comfortable, smooth and easy to live with? 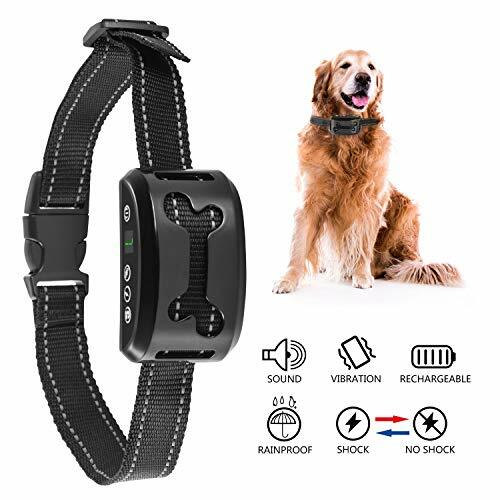 Knowing the key features of each product you get for your pet will greatly help in saving you time, money and effort as well as making a firm decision.